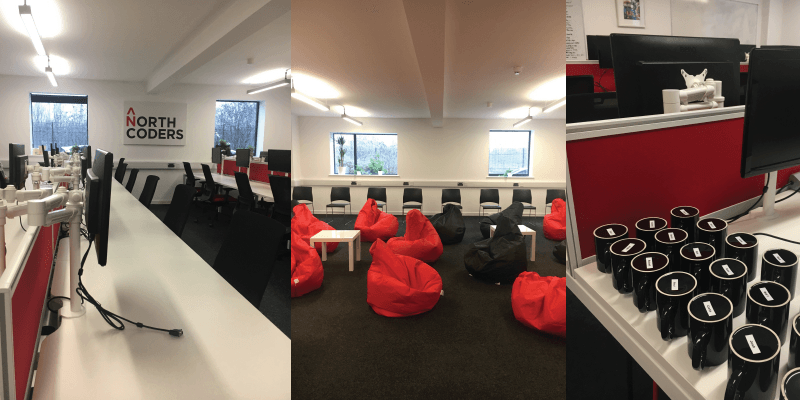 It was a busy week last week as we were preparing for our fourth and largest ever cohort at Northcoders. When we ran our first cohort last year there we had 10 students and now we’ve just welcomed 19 new faces through our doors. Accommodating larger cohorts has involved some logistical changes in the office - we all pitched in last week to fit out an additional lecture theatre in our new adjoining room in The Sharp Project and to build a new bank of desks for our students to work at. A trip to IKEA, a handyman called Boomer, a delivery of beanbags, a pot of paint and a few beers later, and our new room was looking lovely and ready to go! Along with a new room and a new cohort, we welcomed a couple of new faces to the teaching team. Adrian, who studied with us on the second cohort (July - October 2016) has been working on an internal development project since he graduated and now that’s coming to an end he’s joining us as a Northcoder in Residence to help students on the current cohort. We are also welcoming Daryl, an exceptional student from the third cohort (October 2016 - January 2017) who will be working alongside Adrian. I am really excited about our new team - Daryl and Adrian are going to be a fantastic help in the classroom and will be really invaluable to our new students. Having people on hand who have recently been through the same experiences as you have have done exceptionally well is a real inspiration and privilege, and I can already sense that this cohort is going to be a pretty amazing one. We have 19 extremely strong and eager students and I can’t wait to see what they achieve over the next 3 months!